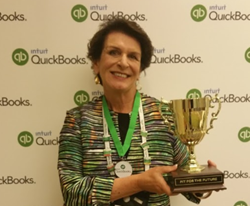 Insightful Accountant awards President of TaraByte Solutions, Jeanne Tarazevits, the "2016 Top Integrations QuickBooks ProAdvisor award. TaraByte Solutions is a full service QuickBooks provider specializes in helping QuickBooks customers integrate inventory, manufacturing and e-commerce applications. TaraByte Solutions announced today that President, Jeanne Tarazevits, has received the “2016 Top Integrations QuickBooks ProAdvisor” award from Insightful Accountant, an independent news and information source that keeps small business advisors current on the latest news about accounting technology. For the past three years Insightful Accountant has created a list of the Top 100 QuickBooks ProAdvisors. Jeanne has been on this list each time. For this 2016 Top Integrations QuickBooks ProAdvisor award, Insightful Accountant singled out just 10 of 2016’s “top 100” advisors. To be considered for this exclusive recognition, Jeanne underwent a thorough review that included an open nomination, open voting and lengthy application. Qualifications for this objective, points-based program include educational level, QuickBooks certifications, types of work performed, types and numbers of clients served and the level of engagement advisors have with the products and services in the Intuit ecosystem. TaraByte Solutions is a full service QuickBooks provider that focuses on inventory, manufacturing and e-commerce applications. The firm integrates QuickBooks with Fishbowl and other third party add-ons. By getting inventory management, accounting and manufacturing systems all working together seamlessly, TaraByte helps clients save time and money, and changes the way they do business. As a QuickBooks integrations specialist TaraByte Solutions offers implementation, integration, customization, data analysis and troubleshooting of QuickBooks with Fishbowl, Method and other add-on programs. For more information about TaraByte Solutions, visit the firm’s website at http://www.TaraByte.com.